Cruise down the Ohio River on the Belle of Cincinnati or the River Queen for a sightseeing cruise, Captain's lunch or dinner cruise or the Admiral's dinner cruise. Package includes your choice of Cincinnati region hotel accommodations. 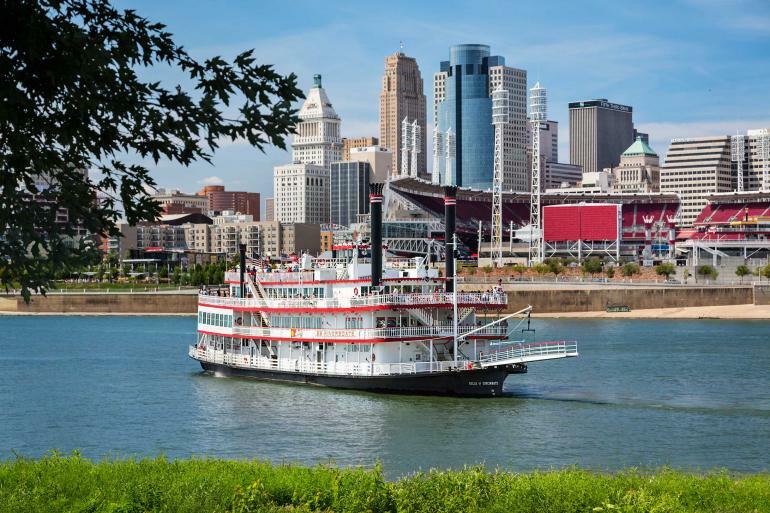 One of the Cincinnati area's top attractions, BB Riverboats specializes in an array of lunch, sightseeing, and dinner cruises on the beautiful Ohio River. BB Riverboats' flagship, the Belle of Cincinnati, is the largest and most lavish excursion boat on the Ohio River and the River Queen is a stunning complement to this impressive fleet. Bring the family to learn some history about the Cincinnati area, enjoy a delicious meal, or dance under the stars in the most unique way to see the city. Come find out why everything is better on the river! While exploring Newport Aquarium's million gallons of fun, guests have the opportunity to touch a shark, play in the interactive frog bog and even pet a penguin during the Penguin Encounter. With sixteen lanes of rockin’ bowling, the excitement never stops.